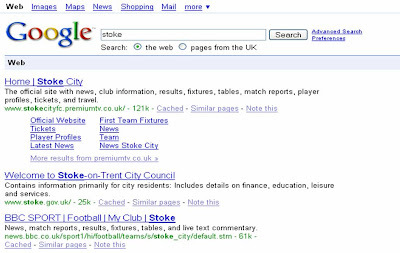 Google Football shows each club's next Premier League fixture - but struggles with Bolton, Hull, Portsmouth and Stoke! 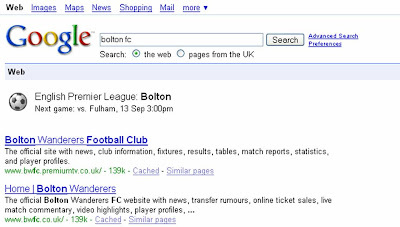 Google Football (my label not theirs) makes it easy to find out the next fixture for a chosen Premier League club. 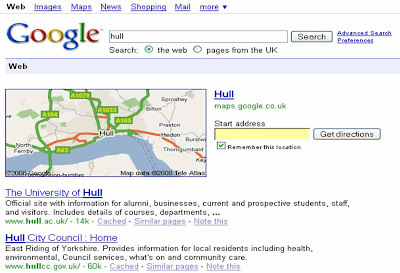 Just type in 'Arsenal' or 'Chelsea' or another and Google will serve up their next Premier League fixture at the top of the results. It is also clever as it will serve up the same result even if a variant on the name is entered eg 'Manchester City' or 'Man City' both produce the correct fixture. 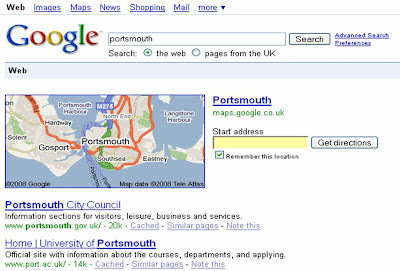 Google Football can't do it for all Premiership teams though. 'Stoke City' works but 'Stoke' doesn't. I don't know how long the Google Football fixture service has been available but it's an interesting (and useful) use for the Google OneBox functionality - I hope they extend it to include Championship clubs soon! 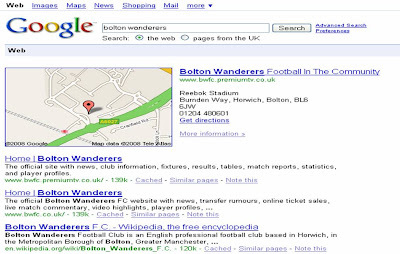 "neither 'Bolton' or 'Bolton Wanderers' return results"
How very sad, but very true.